Taking the guesswork out of shooting up to 99 yards, the IQ DEFINE laser rangefinding bowsight is sure to be a top seller in 2018. Known for quality and innovation, IQ has once again raised the bar by integrating a laser rangefinder system directly into a premium five-pin archery sight. Built on the foundation of high-quality construction and an incredibly accurate sighting system, the new IQ DEFINE bow-mounted laser rangefinder sight will be in high demand this summer and fall. Purpose built to be durable, precise and accurate, each component of the IQ DEFINE is optimized for ultimate performance in the field. By incorporating a laser rangefinder and pin sight into a single unit, bowhunters can realize the benefit of less movement during critical moments leading up to the shot and precision ranging while at full draw. 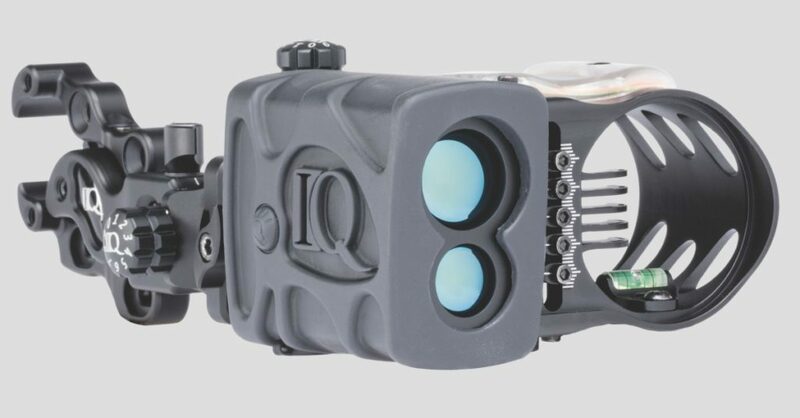 Driven by high-performance circuitry, the backbone of the IQ DEFINE’s laser rangefinding system provides exceptional resolution with accuracy to +/- 1-yard, instantly displayed on a vivid blue OLED conveniently placed within the user’s line-of-sight. One-touch trigger-activated scan mode and full angle compensation take the guesswork out of moving or stationary targets for up to 2 minutes, and eliminate additional movement associated with reaching for a handheld rangefinder. Simply touch the bow-mounted external trigger, view the inline yardage display, select the proper pin and then execute the shot. The compact and lightweight IQ DEFINE is powered by a single CR2 battery. Packed with features, the IQ DEFINE weighs only 18.5 ounces thanks to precision-milled 6061 aluminum construction; the bowsight measures 6 3/4 inches long and 4 1/8 inches wide. The direct mount sight bracket system brings the sight closer to the bows riser, offers multiple bow and quiver mounting holes, and doesn’t require second position mounting of the integrated rangefinding unit, eliminating negative impact on bow balance and/or the shooter’s line of sight. 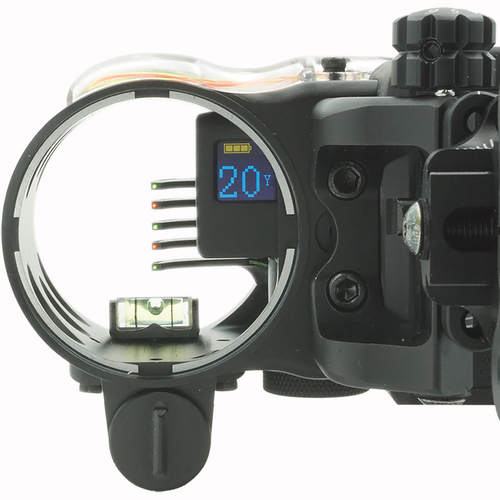 A precision bubble level compliments the system’s 2nd and 3rd axis adjustments further enhancing the pin sight’s accuracy. Five fully contained .019 fiber-optic pins with integrated sight light provide exceptional brightness through a full range of tool-free micro adjustment of both windage and elevation. A removable sight-in laser, tool-free locking knobs and laser-etched windage and elevation marks provide intuitive yet detailed set up and the peace of mind that the users pins will remain true. Available in right hand only for a suggested retail price of $379.99, the IQ DEFINE delivers an intelligent and intuitive laser rangefinder pin sight system that meets all the needs of the serious bowhunter — those same shooters who will be walking through your archery shop door in the coming months. Will you be ready to show them this innovative bowsight?